How do we protect our open spaces? Lockerbie - could it have been Groby? Groby Street Fair has announced that this year's Fair, on June 23 2019, will support the Leicester Children's Holidays charity. Just like the charity the Street Fair relies on external funding and sponsorship to help make it viable, so it is unable to make a financial contribution to this worthwhile cause. The organisers feel, however, that with up to a third of residents set to attend the Fair it will provide a great platform for the charity to raise awareness of it's activities and for visitors to talk to representatives about the work they do. This won't be a fund raising initiative and visitors will not be asked for cash or pledges. In 1896 Leicester Boys’ Club opened at 22 Newarke Street, and two years later Alderman Wakerley, the Mayor, called a public meeting to discuss a week’s holiday by the sea for boys who attended the clubs. Leicester Poor Boys’ Summer Camp Association was founded. At the Bank Holiday in early August, the first group of boys went camping in tents on the sand hills at Mablethorpe. Girls need holidays too, and in 1900 they joined the boys for the first time, in a purpose built wooden building. The boys continued to sleep in tents, but in 1908 a Boys’ Home was built in Mablethorpe, next to the Girls’ Home. In 1910 an Open Air School for weak and sickly children was opened by the Education Committee in the holiday homes in the autumn, after the summer season ended. In 1919 holidays re-commenced after being suspended during the First World War, with the next major development in 1937 : the permanent holiday centre for both boys and girls opened on the sandhills at Mablethorpe. In 1951 children from the County of Leicestershire began to go to Mablethorpe and by the time financial pressures forced the closure of the holiday home 67,000 children had benefited. The work of the charity goes on, but now the money raised goes into providing experiences for the children instead of costly building maintenance. 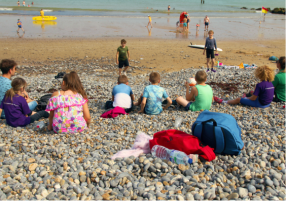 In 2018 the first party of 20 Leicester children were taken by the renamed Leicester Children’s Holidays charity on an exciting adventure holiday at Hilltop, Sheringham. This year it will be 40 children, and next year the target is 80. At £391 per child for 5 days holiday the charity clearly needs the continuing support of the people of Leicestershire. Borough Councillor Martin Cartwright, who chose the charity to support in his year as Mayor of Hinckley and Bosworth Borough Council, hopes residents will continue to contribute funding. When the first Groby Street Fair was planned back in 2011 the organisers were taking a step into the unknown. After much hard work behind the scenes they had the funding in place and put together a unique family event with trading stalls and amusements all underpinned by a day long entertainment programme. They thought it would be well received by the people of Groby but they hadn't even dared to speculate that it would be so successful that it would become a fixture in the local calendar. So for the years that followed preparations that started in the dark nights of winter came to fruition with the Groby Street Fair each summer. This year the dilemma has been whether to continue with the same winning formula or perhaps use the formula to deliver a slightly different event. use the Fair to raise funds and so this announcement of the date will enable them to make their own decisions about the timing of their own events in order to maximise income. Sponsorship will continue to be a source of support for the Fair . “We are asking local businesses to consider making a donation, however small, to ensure that this brand new venture can take place,” the spokesperson added. “We are also now taking bookings for trading space.” Sponsorship and booking enquiries should be sent to grobystreetfair@virginmedia.com. Clearly a summer format has to be adapted to take account of the November weather as no-one is likely to want to sit on the grass in the church grounds watching the entertainment. There will still be music but the emphasis will be more on seasonal entertainment without the large stage. Detailed planning is now underway but it may be a few months before the committee is ready to publish more information. What is already clear, however, is that whilst our Prime Minister has been flying around Europe meeting Heads of State the committee has been locked in negotiations with someone that children everywhere recognise as much more important to their Christmas happiness. And that special person is set to make a very special entrance at the Groby Victorian Christmas Street Fair on November 12th. That's without doubt a date to be putting on your calendar. Street Fair – replace entertainers with talent contest? An application for financial help for the Groby Street Fair led to the finances of the organisation being put under the spotlight at the September meeting of the Parish Council. The task facing members was complicated by the fact that although the recent 2015 event lost money for the first time they did not have access to the current accounts, only earlier years. One of the Street Fair Committee, who is also a Parish Council member, explained that as the application had been put in before the Fair the 2015 accounts were not available. The reason for a grant application whilst there was cash in the bank was queried and he explained that the Fair needed to start the new year with cash in hand as some expenses had to be paid before income was received. It was agreed that any decision would be deferred until the October meeting to give the Street Fair Committee time to provide a more up to date financial statement. The Chairman said the account would be gone through with a fine tooth comb and questions would be asked on specifics as there were members who had expressed concerns on how the money was being spent. The 2015 loss was largely attributed to a late and unexpected expense, the cost of hiring a stage for the entertainment. It was the cost of providing entertainment which was the subject of some controversy. Entertainers incur expenses to appear at the Fair and so receive a payment to offset the costs they incur. With regard to the legitimacy of paying expenses it was argued that it was reasonable as the entertainers may have travelled from across the county. Some of the acts had many performers and these included the big band and scouts marching band. The Chairman thought that local people should be pleased that they have a platform to showcase themselves. He suggested that it needs a bit more creative thinking and it could be cheaper to run the entertainment as a talent competition with the entrants paying their own expenses. One member said that the village needed the Street Fair but its position on a sloping site said made it difficult for elderly people. With regard to the expenditure for tables and chairs she thought that Groby Village Hall and other organisations would probably be happy to lend tables if asked, though the Chairman thought that this was an issue for the internal management of the Fair. A spokesperson for the Street Fair said that no acknowledgement of the application had yet been received from the Parish Council and it would be inappropriate to make any comment until after the Council raised with the Committee any queries or concerns that members may have. 11.20 Martinshaw Primary School followed by Lady Jane Grey and Elizabeth Woodville schools. Last year the Groby Street Fair started with the Syston Scout and Guides Band and it was such a success that they are back for the 2015. This year, however, they will lead a Carnival Parade through the village on the morning of Saturday 20th June. The Parade will assemble at the Lady Jane Grey/Budgens end of Pymm Ley Lane and will take a route to the Fair through the village which will include Glebe Road, Crane Ley Road, Chapel Hill and Ratby Road. So be sure to give them your support and a wave as they pass by. If you go down to the post office at 11.am on the morning of the fair you won't find Sue and Harry Lakhani there as they will be on Markfield Road officially opening the proceedings. This will be followed by the judging of the carnival entries as they pass the stage and 11.20 visitors will be entertained by Martinshaw Primary School followed by Lady Jane Grey and Elizabeth Woodville schools. At noon the LOROS Choir led by Judy Dodd will take to the stage. Two of the most regular performers at the Street Fair have been local folk duo On the Fence, and they'll be back after the choir. At 13.50 Roxanne Dinsdale and her Bellyliscious Dancers will return after a very successful debut last year. As a young girl Roxanne studied Classical ballet for many years, but after a change in direction went on to perform as a cabaret dancer. During her early teens she developed an interest in Middle Eastern dance, and became Britain's youngest professional Belly dancer at the age of 17. "Some years later I rescued a snake that was in a very poor state," Roxanne said. "When I had nursed him back to health I realised he had a lot of talent and he has been paying me back ever since by performing wonderful tricks with me in the show. I have developed my international cabaret style over the years, which incorporates steps from Arabic, Turkish, Egyptian and American cabaret." Roxanne's colourful and professional dance routine will be followed by the Magna Band playing show, classic and film tunes. The musical theme will continue through the afternoon with an appearance by Coopers Last Stand playing 60's harmony pop, then Roboter, an enjoyable blend of acoustic punk/fusion. Raffle tickets will be on sale all day with the draw taking place at 17.00. Cathy Stephens has donated another very special prize and there's lots more to be won. The Fair will then end with some great nostalgic R'nB sounds from Dr K's Gastric Band, closing at 18.00. There'll be songs by blues greats Muddy Waters and BB King, as well as other favourites by the Small Faces, Fleetwood Mac, the Animals and John Fogerty, remembered for fronting Creedence Clearwater Revival. Add in the stalls, the food, the games, the rides, together with(hopefully) lots of sunshine and it looks as if the winning formula continues for another year. So get out and enjoy the day. There's always a need for helpers to clear up at the end of the day and re-open Markfield Road to traffic, so if you can spend between 30 minutes and an hour helping it would be greatly appreciated. When the Scouts and Guides Band marched up Markfield Road at the Street Fair last year it must have brought back memories for many of the days when people had to make their own entertainment. The community still loves to get together when given the opportunity as demonstrated by the support for Groby Sings, the Village Show, Carols around the Christmas Tree and other outdoor events at the Community College, the pub and the club. Groby Street Fair has been a great success in getting folk together and has now established itself as an annual event. Markfield Road will be closed for the day on Saturday 20th June for the 5th Groby Street Fair. How time flies. The challenge for the organisers is to find something new, and the popularity of the Scout and Guide band in 2014 is being built on for this year's event, which is to be a Street Fair and Carnival Parade. The band will lead a procession through the village. There'll be prizes for the different classes in the parade but if you want to take part just remember that no vehicles will be allowed, so don't go out and hire a open backed truck to carry your group! If you want to be part of the fun you can email grobystreetfair@virginmedia.com. You can also use this email address if you want to find out more about volunteering to help in the run up to 20th June or on the day, or would like to offer help as a marshal. If you only have a little time to spare you'd be surprised how welcome you will be made if you turn up at the end of the day to help clear away the chairs and tables. By that time those who have been there since early in the morning show definite signs of wilting. Groby Street Fair is asking Spotlight readers to support their bid for a slice of the £35,000 cake being offered to groups, organisations and charities. The Leicester Mercury has teamed up with the Nottingham Building Society to give cash to the first 150 eligible groups to register. The groups will be announced in the paper and readers will be able to vote for their favourite by filling out and sending in coupons printed daily in the paper. The more coupons a group collects, the bigger the slice of the prize fund it will be given. Meanwhile the organisers are still on the look out for someone to perform the opening ceremony and is asking readers for their nominations. Email your suggestion to grobystreetfair@virginmedia.com or text 07866 123 151. This year the Fair is being held on 21st June, so don't forget to put it in the calendar on your smartphone, your tablet or even your diary, if you still have one. You'll find some news about the entertainment programme below and the full schedule will be online and in the June Groby Spotlight. Credit must go to the volunteers who put together the Groby Street Fair. It has matured from a question in people's minds- “can we pull such an event off?” - into an annual event on the Groby calendar. This year it will be held on Saturday 21st June between 11.00am and 6.00pm. That's not far away and time flies. The entertainment programme for the day has just been published and can be seen on www.grobystreetfair.tk. You can also keep up to date with the event on facebook. Want to nominate someone to perform the opening ceremony? The organisers will be pleased to hear from you(see Jottings). If you have been for the last couple of years and are thinking it will be much the same you are wrong. It's true that there are some old favourites like local schools, the children's favourite stilt man and magician Kevin Burke, local folk artists On the Fence, or melodic punk dispensers Goldstein are still there. But there will also be a host of new entertainers and at 1.00pm the Fair will come alive with the the colour and sounds of Traditional Chinese Lion Dancers – look at the website for a video preview. Later in the afternoon you'll be able to see a stunning exhibition of Kendo, enthralling Japanese Marshal arts. Kendo, is the art of Japanese fencing. "Ken" is from the character meaning sword. The character for "Do" means way or path. “Kendo” translates as "the way of the sword" – a path in life which is followed through the training of Kendo. Practice consists of several different exercises. Each exercise is aimed to improve different aspects of strength and skill. For beginners, the repetitive practice of basic movements is stressed in order to acquire the ability of moving without thinking. A Kendo player must learn to be able to counter an attack instantaneously whenever the opponent moves. As one progresses, more spiritual understanding is sought through continuous practice in order to be in control of any kind of situation. Besides such training, the practice of etiquette through Kendo is demanded as well, since the goal of Kendo is to develop one's character, i.e. self-confidence, courtesy, and respect for others. This was of utmost importance for all Samurai. The great big band sounds have always been popular at the Street Fair and this year they will be delivered by The Great Bowden Recital Trust Jazz & Swing Band. This sounds like one to make sure you have a seat for - a 30-strong Jazz & Swing Band. Tony Rifugiato, is a highly experienced Musical Director and musician who set up Mel-Tone, a musical instrument retail business in Melton Mowbray which ran successfully for 29 years. Mel-Tone was a centre of excellence for music, an important aspect of which was its Music School, which over the years trained thousands of aspiring musicians, many of whom went on to be professional players. Tony is concentrating on Musical Direction, performance and tuition. Now a familiar name across the East Midlands his theatre credits range from Puccini operas to modern musicals such as Disco Inferno. In addition to Musical productions, he has extensive experience with orchestras, brass bands, jazz & swing bands and wind bands so this is going to be something not to miss. If that doesn't push your buttons you may prefer Franco, a local band playing music ranging from 60's pop to the latest hits, including the Beatles, Robbie, Adele, Amy Winehouse and many more. What a line up and a fresh new look for 2014. And with admission pegged at £1 it's a bargain. But please help keep the queues down by sorting out the right money before you reach the gate if you possibly can. It was an early start for the Street Fair committee and volunteers on Saturday September 21st. Hearts must have sunk a little when the first spots of rain fell from an overcast sky. No-one was singing 'Things can only get better' but many must have been thinking it and must have been relieved when they did. For the third year the organisers have encouraged the people of Groby to turn out and enjoy the car free environment of Markfield Road. 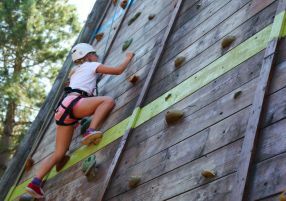 With the admission fee pegged at last year's pound it was once again great value, as in addition to the stalls there was food, rides, the climbing wall, fun for the children and an entertainment programme with something for everyone. This included a return visit of punk band Goldstein for their last gig of the year before two of the members resumed their studies. "Variety is the spice of life," said Tom Hickingbottom, "and we aren't afraid to mix some ska or rap into our songs to keep things interesting." A straw poll of the traders also found that most were pleased with the day. "It's been a good day for my stall. 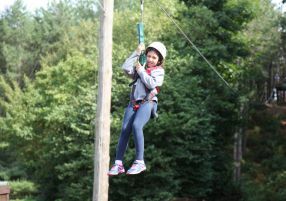 I'd certainly come again,” said one, whilst another commented "I don't know what it is but there's something special about the Groby event." The friendly atmosphere and the excellent organisation of the event also drew praise from the traders. Whilst most were positive about the business they had done there were on or two who were a little disappointed, but it all seemed to be a matter of the type of goods they were selling and the ticket prices. There is one product which always sells well, and that's food. And there was plenty of choice, including local produce which couldn't have been fresher unless you'd picked it yourself. What looked like an overstocked allotment society stall at the start of the day was as bare as the victim of a locust attack at the end. And for someone looking for something a little more continental there was the trader cooking your crepe while you waited. “No, I don't have a french accent,” he admitted. When asked whether he also cooked galettes, the savoury version made from buckwheat, he said he would like to but it was problematical. He explained that he had been advised on Health and Safety grounds to stick with the pre-mixed crepe product. “My preference is to start from scratch with fresh eggs but once I cross that threshold the paperwork starts to mount as the provenance of the eggs and other ingredients has to be checked and recorded,” he added. At the end of the day the crowds started to thin but any concerns that the Groby Sings community choir placing at the end of the day might be too late for visitors were proved unfounded. The audience split themselves between the Markfield Road seats and the church grounds dress circle. And as the last notes of their final song died away the next stage of the operation began. It was time for everyone to dismantle everything, clear up and go home exhausted. Like most other Groby youngsters her school life started at Elizabeth Woodville Primary, where she remembers planting a tree in the grounds for the Queens Silver Jubilee. Then it was on to Brookvale and the Community College followed by nurse training at Charles Frear's School of Nursing. She left Groby in 1991 when she married and currently has a very demanding job as a specialist school nurse working with children in the city who have emotional, behavioural and mental health problems. For many people eating chocolate is a stress buster, but Louise goes one step further and creates her own chocolate delights. “I've always loved chocolate and cooking,” she explained, “so I combined the two after having a go at making my own chocolate decorations for a cake I was making. I'd found the prices being charged were extortionate and discovered there was a gap for high quality hand crafted chocolate at reasonable prices. I did my research and enjoyed finding a supplier who provides me with really good Belgian chocolate and I was taught how to temper the different sorts. It's far more complex than I thought.” Tempering controls the crystallisation of the cocoa butter so that only consistently small crystals are produced, resulting in much better-quality chocolate. She has about 20-25 different moulds but adds more constantly, trying to find moulds to meet individual requests and have seasonal as well as all year round sellers. So currently it's the Christmas moulds that are getting the most use. Louise (née Louise Bowater) sells at craft fairs, street fairs,food and fresh produce fairs as well as by word of mouth, and a riding school shop. She's also done a couple of weddings making favours for the bride and groom and has a page on facebook( Bemysweetie). When the organisers say there's something for everyone they really mean it, as Goldstein bring something a little different to the party for their return visit. 2013 has seen the band headline most of their local gigs, and they've most recently supported skacore masters Random Hand and Anti-Vigilante, as well as punkstep innovators The Karma Party. Punk sounds are mixed with more melodic vocals and skillful playing. "Variety is the spice of life," says Tom Hickingbottom, " and we aren't afraid to mix some ska or rap into our songs to keep things interesting." Lovers of big band music will be pleased to see the return of the Soar Valley Music Centre Big Band. A Street Fair favourite performing a range of music including swing, soul, jazz & pop. Wreckless Venture will be on stage at 16.00pm. They are a guitar based band of "mature" rockers based in North Leicestershire / East Derbyshire, playing stuff from Van Morrison's "Brown Eyed Girl " to Golden Earring's Radar Love, and rock from Ozzie's Paranoid to the Stones' Jumping Jack Flash. Jim's been around the Leicester music scene for some time but still thinks he's only 27!!! His biggest handicap is that after a gig he needs "Ralgex" on his knees from jumping around so much! His favourite artistes are the Stones, David Bowie and Greenday but he's also an Opera freak loving Mozart, Bizet and Gounod. Al is a local (Griffydam) lad and plays guitars ( lots of them) His favourite bands include Stones, Lynyrd Skynyrd.........(and anyone who puts vicious riffs in their songs). Ray comes from a bit up- north from most of us but now lives near Dave's favourite place, the home of the Bass Brewery (Burton on Trent) His favourite bands include include The Eagles, Yes and Wishbone Ash and when he's not playing a mean bass riff he's practising classical guitar. Dave's a foreigner in that he's from the West Midlands, his favourite bands include Lynyrd Skynyrd, Deep Purple, and Edith Piaf? Following their successful concerts at Groby Community College the Groby Sings Choir has been confirmed as the closing act of the 2013 Street Fair entertainment. Karen Silverwood will be conducting as Helen Hayes is otherwise engaged in a concert. Kevin Burke will no doubt come down to earth for his magic act. "It will be wonderful to be back! ", Kevin told us. "I do love coming to Groby and walking up and down the street on my stilts gives me the best work-out of the year! Also, to everyone who sat and watched the kid's magic show last year, I can assure them that this year it will be a totally different show!!" The current UK junior speed climbing champion, Orrin Coley, will be one of the two experts running the climbing wall. Orrin is known as the UK’s Spiderman. 1100 Grand Opening Opening performed Dot Bell, of the well known Groby nursery school. 1210 On The Fence Julia and Dave, a Groby Folk duo. 1525 Kevin Burke (at front of the stage) Kevin Burke's magic show, not to be missed. The TOWER, The climbing wall from the TOWER at Beaumont Leys Leisure Centre will be available for all, young and old to have a go under expert supervision. And lots more including around 40 stalls, food and drink. Admission just £1 with accompanied children free. The organising committee has decided that, despite the hard work involved and the crippling cost of closing Markfield Road for a day, they will bring us another Street Fair in 2013. The event will probably take place in late September. With six months to go there's time for you to reflect on the two successful fairs already held and let them know what aspects of the street fair you liked best, what you weren't too keen on. All feedback will be welcome, so email your comments to contact@grobyonline.tk and they'll be passed on. The sun came out on the day of the Groby Street Fair and so did thousands of local residents. For a single day Markfield Road was transformed from somewhere that you dodge the cars and buses on their way to the A50 to a place where you could safely stroll with children, browse the stalls, buy something to eat and drink, watch the family having fun and sit in the sunshine or shade listening to the music. The Street Fair is not a commercial profit making enterprise – it is run by volunteers. This year the organisers had no Lottery Grant so they reluctantly had to introduce an admission charge to recover some of the £2500 they had to pay the County Council to close Markfield Road. As the last visitors drifted away the volunteers started the tidy up operation and soon all the tables and chairs had been stored away ready for collection and Markfield Road was reopened. The 2011 Groby Street Fair was such a success that it left villagers saying "it should be an annual event". As Markfield Road reopened after the Fair last June the exhausted organising committee must have been wondering whether it could be repeated. But the demand didn't go away, and the pleasure it gave villagers and the funds it raised for good causes who had stalls reinvigorated the committee, who have said "yes we can." So here's a date for your diary - September 8th 2012. It's set to be the sunniest day of the year, and hopefully much warmer than the Royal Jubilee weekend. Keep your fingers crossed and remember that a grey day didn't stop the fun in June 2011. The Street Fair organisers are hoping that the only cloud will be the bill for more than £2500 for the closure of Markfield Road on September 8th, the day of the event. They are determined that this won't stop the fair going ahead despite the fact that this year there is no grant aid available from the Big Lottery fund. Like this year's event the 2011 fair was also partly funded by rental charges for stalls. There was also income from the sale of 'lucky programmes' at £1 each which included the chance to win a prize, but this was not as successful as had been hoped. The effect was that part of the costs of organising the event were not spread evenly amongst all who attended. The fair is not a commercial organisation so losing money is not an option. The organisers need to ensure that there is sufficient income to cover the road closure costs as well as other items such as the rental of tables and chairs and admin costs such as advertising. With such a financial target it has been decided, somewhat reluctantly, to introduce an admission charge of £1 per person with accompanied children free. In 2011 fund raising stall holders were very pleased with the generosity of those who attended and the amount they raised for good causes and this year more than 40 stalls were booked quite quickly. The format will be similar to 2011 with live music all day ending with a jazz session at 4pm. One of the lessons of the 2011 Street Fair was that you can never have too many helping hands. A small team brought everything together and made it happen but it was difficult and more help would have spread the load, particularly at the end of the day when everything had to be dismantled and cleared to allow the road to reopen. Can you help on the day? If you can help please email info@grobystreetfair.co.uk or ring on 0116 2876724 or 01530 243469. There'll be more news about the Street Fair in the next Spotlight in August. There's a Street Fair website this year where you can keep up to date with the plans and look at the Groby Spotlight photo gallery from 2011. When it's finalised you'll also be able to see the full programme for the day by going to www.grobystreetfair.tk. 2011 Street Fair & Ceilidh - did you miss it? With the weather forecast changing daily the Street Fair organisers had their fingers crossed hoping that the event would not be a washout. With overcast skies and the occasional light dusting of rain the weather was not ideal but it was warm and the cloud cover made it comfortable to stand or sit without having to find shade. After lunch the people of Groby arrived, much to the pleasure of stallholders. The Street Fair turned out to be good for fund raising, and two groups each reported takings in excess of £200 each. Although the final sum raised for good causes is not known it was clear from the faces of the volunteers running charity or local community organisation stalls that they were very pleased with the cash taken during the afternoon. Local businesses were also pleased with the boost given to trade by the influx of visitors to the centre of the village. At Flint they reported an excellent trading day, adding that they would be very pleased to see a similar event in the future. And anyone who dropped into the Stamford Arms will know that business was booming. Jim, the landlord at the Stamford, said that they didn't know quite what to expect but he was very pleased with the way it all turned out. He would also like to see another Street Fair. The musical mix was outstanding and of very high quality. With a wide range of entertainment running non-stop all afternoon there was something for everyone, with soloists, Morris Dancers, Stanley Opera from Hinckley, Scottish dancers, punk rock, the Zufflers and punchy big band music from musicians from the Soar Valley Music Centre. The church grounds provided a useful balcony for many visitors to sit and enjoy the music. For many the high spot of the day was the chance to hear local blues and rock star Aynsley Lister, who also opened the event at noon. Performing solo Aynsley left the crowd shouting for more, and that's always the best way to leave your audience. As the Street Fair drew to a close The Zufflers took to the stage. The band had made a great contribution to the smooth running of the entertainment by setting up it's equipment in the morning and making it available to all other performers. In the evening Malarkey Ceilidh Band played for dancers and and those who just wanted to watch and listen. The evening finished with the prize draw and by 9 pm the road was open again. There was little sign of the months of preparation that had gone into the event. All that was left were the photos and memories of a successful day and a team of exhausted organisers. As well as opening the Street Fair Groby's own Aynsley Lister played a short set. This wase the first time he has played in Groby since achieving international recognition as a blues and rock artiste. Find out more about his charity cycle ride. Click here for a full list of entertainment and stallholders. The Groby Street Fair and Ceilidh has received support from the Big Lottery Fund.